The Friends are grateful to everyone who has emailed the ward councillors. The councillors have not been replying to the specific matters raised in the emails but Cllr Dickson has instead been sending out a standard email on behalf of himself and the other two ward councillors. Attached here under separate headings are corrections to some of the misinformation it contains. 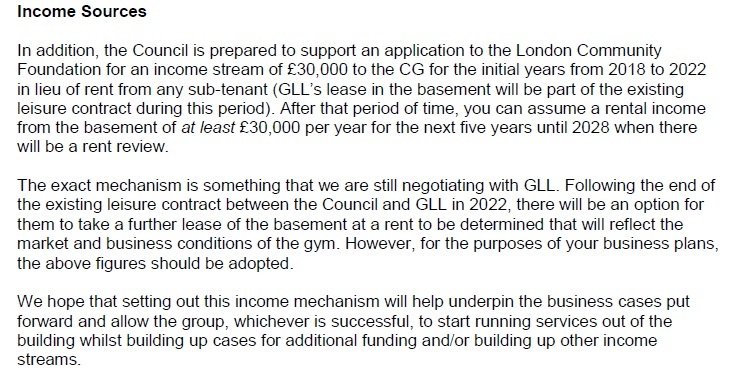 Lambeth have signed a contract for £1.25 million to excavate the basement for a gym: Forcia contract. This is only the first stage of the work, the next depends on financing from GLL, which has not yet been agreed. The total cost is estimated at £3 million. The first stage is estimated to take 7 months. Lambeth have stated that no rent will be paid by the gym to support the library until 2023: letter from Lambeth, 31st March 2017. Lambeth propose to transfer the Carnegie to the 'Carnegie Community Trust' (CCT), a small group of self-appointed individuals without widespread community support. The CCT also has plans for major redevelopment work, of up to £5 million (but how this will be paid for is unknown): asset transfer assessment. 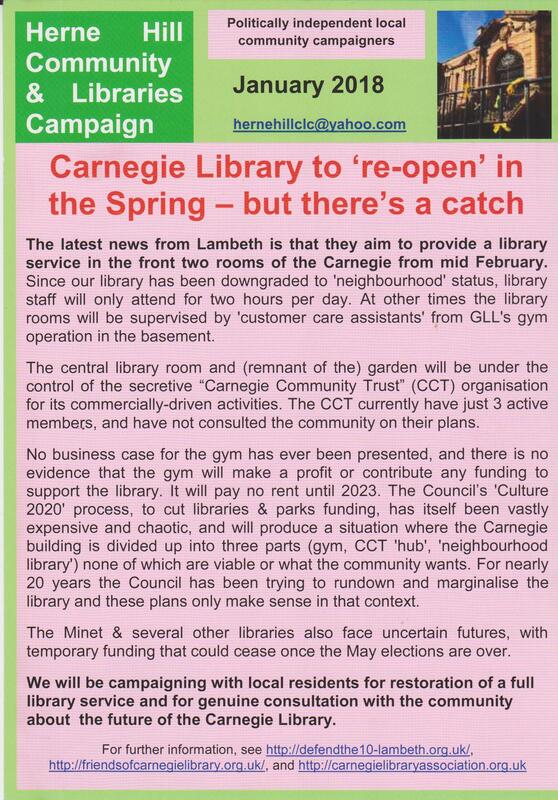 Lambeth rejected the bid for the asset transfer by the Carnegie Library Association (CLA), formed by the Friends of Carnegie Library and the library user groups, with elected trustees, and which is accountable to over 300 members. Lambeth confirm in the asset transfer document that the Carnegie will become a "neighbourhood library service, ... staffed for approximately two hours per day ... consist of self-service facilities providing residents with access to a limited supply of books available for lending and drop off." We are circulating more detail on all of this in our current bulletin. The Friends of Carnegie Library will fight on. We will be intensifying the campaign to get the library back for local people, including for the community groups who used it before Lambeth closed the library in March last year. If you aren’t already a member, please join us via the website or by post.